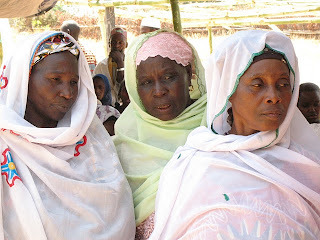 Project Hope, a collaboration between Pathfinder International, Population Services International (PSI), and Tostan, organized a two day event on May 26 and 27, devoted to the discussion of Islam and female genital cutting (FGC). More than 60 religious leaders from Guinea-Conakry, including both Muslims and Christians, took part in the discussions held under the patronage of the Secretary General of Religious Affairs, the Minister of National Solidarity for the Promotion of Women and Children, and the Minister of Public Health and Hygiene. The Minister of Public Health and Hygiene, Dr. Rachid Madina, reminded those gathered at the discussion that 96% of women in Guinea undergo FGC, and he humbly asked the religious leaders to actively engage in efforts to help the country abandon the practice. Taking place at the Islamic Center of Donka in Guinea-Conakry, the discussions allowed leaders to harmonize their position on harmful traditional practices such as FGC and child/forced marriage. A declaration was then issued which condemned the harmful practice and called on the country’s political leaders to do the same. Through the declaration, Guinea-Conakry’s religious leaders demonstrated their belief that the physical as well as mental integrity of a girl or woman is negatively affected when she is cut. To read a list of recommendations issued by the country’s religious leaders adding momentum to the international movement for the abandonment of FGC, click the read more link below. That the political and religious authorities of Guinea, following the example of other countries, severely punish all offenders by faithfully applying the law.